Entrance size - how do you decide you've made it too small? Posted: Sat Oct 15, 2016 1:51 pm Post subject: Entrance size - how do you decide you've made it too small? I've reduced the entrance size on a National hive and added a mouse guard. It's a small colony with 4-5 frames of bees. Today with a bit of warmth and sun they're busy on the ivy and mid-afternoon there's a ruck to get in and out. If you watch a returning bee with pollen they take a while to get through the mouse guard and the other bees. Yesterday I saw a wasp coming out when it was quiet so reducing the entrance down to 2 x 9mm holes doesn't totally cure that problem. But has probably helped. How do you decide how big to make the entrance for the busiest time of day? Hi I put a strip of wood across the entrance on my nationals leaving a gap of about 2 inches on one side. 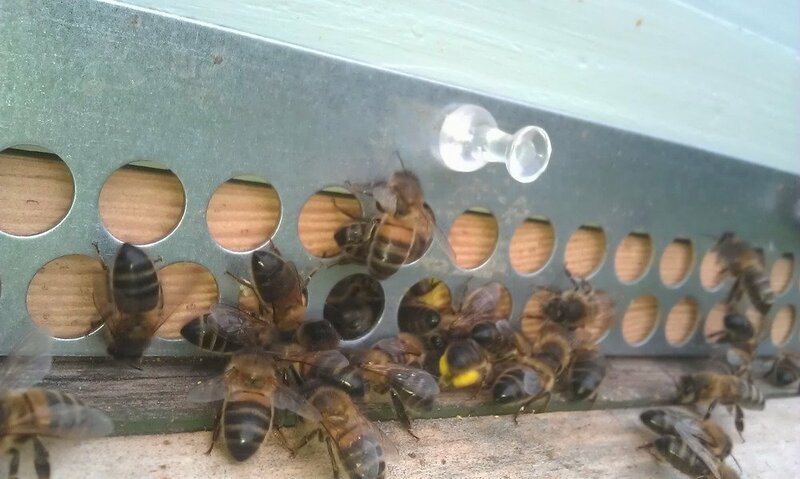 I have attached 1 cm square mesh over the rest of the 2 inch gap and the bees seem to be happy with that. My hives are full of bees and even today with the sunshine they have been busy bringing in pollen etc with no problems getting in and out. Id have thought that what you have done is sufficient for the number of bees you have but I'm sure one of the others might have some good advice. I haven't had trouble with wasps this year, infact I've not seen more than 5 in all the time Ive spent watching them. I should think what you have done would be fine. If you have a wasp problem, the entrance is too small when honeybees can't get in! If you're controlling the wasps successfully, I'd leave it as is - the bees will cope as long as they're not losing pollen loads as the squeeze in. Wasps can destroy a colony in under a week so I consider their control the priority. So the indication is pollen being dislodged shows that the entrance is too small. I've learnt as a newbie not to act quickly. You see a pile of bees trying to get through the entrance and I want to rip off the mouseguard. Wait 5 minutes and the bee-jam has cleared and the traffic looks more organised. I didn't want to make this thread about wasps but I'm more relaxed about them as well. I thought they were attacking and stinging bees on the landing board but now think they have a boxing match with a guard bee and give up. If the entrance is quiet they will wander in unchallenged and, I guess, just steal a bit of nectar (only one or two at a time). Otherwise they are patrolling the grass clearing up casualties they find. Dismembering them and carrying them away. I'm seeing one or two wasps around the hive at a time. I'm guessing an attack involves greater numbers and more aggressive activity. Put a small amount of jam mixed with water in the lower section and invert the top and push/lodge it into the lower section leaving an air space from the bottle neck and the fluid. The idea is only wasps will enter through the funnel top to get to the jammy mixture but can't get out and drown. I made one and keep it slightly to one side of my hTBH because my bees sometime fall from the hive before flying off. I've been using one of Dave Cushman's designs until recently. It seemed to work OK. The wasps then disappeared and I put the traps away. Looks like I'll need them again.